I would suggest this news might represent an ominous bellwether of measurable import to all of us who are hoping to see President Trump elected to a second term. In politics, 2020 is but a blink away, and who will be anointed by the Democrats to challenge President Trump is being decided right now. And I promise you, they are considering Michelle Obama a possibility. Back in May 2016, I published an op-ed entitled: Overlooking the Obvious, if Hillary is Indicted? In that editorial, I attempted to alert people in the late spring of that election year to the possibility that —in the event Hillary Clinton was indicted for the felonies she committed in connection with her infamous private email server— Michelle Obama stood an excellent chance of becoming the candidate who would be chosen by the DNC to replace Hillary at their National Convention in July. “From a progressive point of view, Michelle is a popular, educated, black, liberal female. Translation? She is most probably more appealing to almost all significantly relevant demographic groups than either Biden or Kerry could ever hope to be. Demographics that could foreseeably unite Hillary’s supporters with Bernie’s and, perhaps even lure some “crossovers” back from Trump. As such, would she not provide a clearer path by which her presently fractured party could effectively unite and ultimately defeat Trump? Probably. Of course, none of this transpired in 2016, and for that, I was as glad as I was made later by Hillary’s defeat. That does not mean that Michelle’s candidacy for the presidency should be dismissed as impossible today, however. The reality is that those same reasons given in 2016 as to why the Democrats might find her nomination ideal remain as valid today as they were back then, if not more so. 3. All those from the first Obama presidency who may have a vested interest in finding some way to forestall the unsealing of rumored indictments for little things like treason and other related felonies. The indisputability of these facts should, at at the very least, give the president and his supporters cause to keep a close watch on Michelle’s present public activities. Only last summer the former FLOTUS was busy enlisting some of her anti-Trump, celebrity friends — including “Hamilton” creator Lin-Manuel Miranda, singers Janelle Monáe and Faith Hill, and actor Tom Hanks — to help her launch a supposedly “nonpartisan” voter-registration campaign called When We All Vote. Then, only a few months later, just last November, she published her new book, Becoming, in coordination with a nation-wide “promotion” campaign that, from all appearances, is exceeding in terms of scope and ambition even that of Hillary’s 2016 presidential campaign. Managed by the same company that promotes Beyoncé’s concert tours, the ten stops of the first leg of her national tour in November and December of 2018 were at arenas with seating capacities hovering around 20,000, not only in Washington, D.C., but also in states like New York, Massachusetts, Colorado, Pennsylvania, Michigan, Tennessee, Illinois, California, and Georgia. And then, to begin this New Year, a few days ago she announced that 14 additional speaking engagements have now been scheduled — so far — to allow even more sell-out crowds to attend her “A Conversation with Michelle Obama” tour in similarly huge venues located this time around in Oregon, Washington, Arizona, Texas, Minnesota, Wisconsin,Ohio, and Florida. If they haven’t done so already, both the president and the RNC might want to compare these “whistle stops” now being made by Michelle to “promote” her book to the following list of the top 10 “key” electoral vote states in 2020: California (45); Texas (38); New York (29); Florida (29); Illinois (20); Pennsylvania (20); Ohio (18); Michigan (16); Georgia (16); North Carolina (15). Mere coincidence? Perhaps. But, then again, maybe not. Either way, what can’t be denied is the fact that these events promoting Michelle — or should I say, her “book” — bear an uncanny resemblance in size and geographic scope to the “MAGA Rallies” of 2016 that helped get President Trump elected. And the single most important fact that might distinguish their rallies is one that may not bode well for the president. 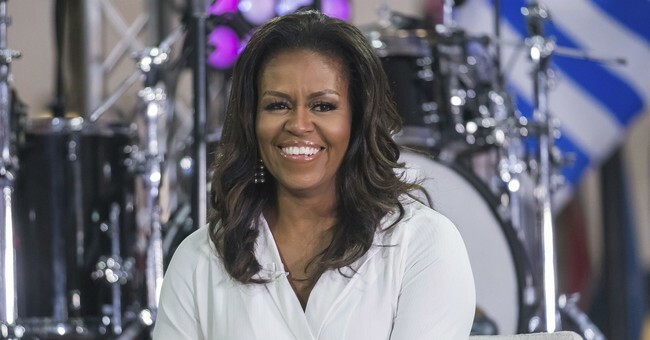 To attend Michelle’s “book signing” events, she is finding herself able to charge those who want to attend as much as $597.00 to $1,435 per ticket! Unless her new book is really that good — which is doubtful — the question this fact should put before the president is this: If he were to charge his supporters such ticket prices, would he be able to fill stadiums next year, like he did in 2016? If not, he really should be taking a long hard look at Michelle Obama… starting right now. Disregard the fact that Michelle has said on numerous occasions that she doesn’t like politics, and has no intention of running for president. In politics, a more accurate reading of a person’s intentions is better often obtained by looking at what they are doing, rather than what they may be saying while they are doing it. And from that perspective, Michelle’s presently scheduled activities strongly suggest the behavior of a person plotting to place herself in the position of becoming the left’s “reluctant hero” in 2020. The only demographically-qualified Democrat who — if they absolutely beg her to do it — is able to rise to the occasion, respond to the pleas of her Party, and save them all from having to endure another four years of President Trump. But whether she is reluctant or not, make no mistake about it. Her potential candidacy, when viewed through the prism of her present, successful endeavors, has all the earmarks of one that could propel her toward having an impact upon Trump’s presidency in 2020 with a force similar to that of a locomotive charging at full throttle that is followed close behind by a tsunami of support. And to stop it, President Trump may very well need … a WALL! Clifford C. Nichols is an attorney licensed to practice in California and New Mexico. He is also a political commentator and the author of a recent satire — My Unspeakable Kindergarten Experience with Kavanaugh — that lampoons the Left’s mistreatment of Justice Kavanaugh. Any comments or questions regarding this editorial may be directed to him at cliff@cnicholslaw.com or www.cnicholslaw.com.